Rose crouched down as he bent over her. ‘Yes, Yes’ she sobbed, praying he’d leave her alone. ‘And then there was Rose …’ – five little words that catapulted Wexford woman, Patricia Quinn, into a dedicated search for information about the great-aunt she never knew. Rose Quinn died in an asylum less than a year after being committed. Such was the stigma attached to having a relative in the asylum that Patricia’s father, John Quinn, only told her about this shortly before he died. In the course of subsequent research Patricia was shocked to discover many coincidences between her life and Rose’s. There was also an unexpected spiritual connection between Rose and Patricia’s daughter, Catherine, that was to result in finding Rose’s burial place – a plot behind the asylum, now known as St Senan’s Hospital. This fascinating book interweaves the search for information about Rose with a reconstruction of her life in novel form. Rose Quinn had to become a restless spirit to have her story told. This is it. 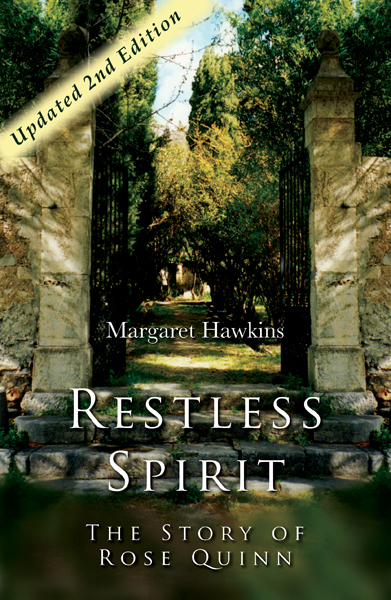 If you’d like to read an excerpt of it click here – Restless Spirit. Available now in a brand new, updated paperback and Kindle version at Amazon.com. For other e-book options, go to this link and select the format for your deviceIt can also be purchased by PayPal (buttons on the right top of the page).